The Spring of 2014 saw the RSPB officially pulling out of the Glaslyn initiative and by this time enough money had been raised to get “Bywyd Gwyllt Glaslyn Wildlife” up and running in its own right. By the end of February the group had achieved its aim of getting a high definition camera upgrade and saw the installation of three new cameras. At last the Glaslyn Ospreys could be seen in all their glory. The original hide at Pont Croesor was now partitioned off and partially used as a visitor and engagement centre. Video signals from the nest cameras were beamed via AirFiber wireless transmission technology to a screen in he hide. At this point in time the project was run entirely by volunteers and was open every weekend throughout the summer. That year both the male and female Ospreys arrived at their usual time with the female arriving two days after the male on 22nd March. By mid April three eggs had been laid and all three chicks hatched successfully on 13th, 14th and 16th May. The chicks were two females ringed Blue 7C and Blue 8C and one male, who was ringed Blue 9C. All three chicks fledged the nest at the beginning of June and by the end of August they had all commenced their migration South. 2015 was an eventful year for the Glaslyn community in many respects. Not only was it a season of great change on the Glaslyn nest itself but changes were also afoot at our site in Pont Croesor. The 31st July saw the realisation of a long held dream for the community when Iolo Williams officially opened the doors to our brand new visitor Centre. This purpose built centre enabled us to engage more effectively with our visitors, our local community, schools and businesses while continuing to promote our fundamental messages of sustainability and stewardship. Likewise, by the end of the season another milestone was achieved with the long awaited commencement of live streaming on our website. Interested followers all over the world could now witness events on our nest directly as they occurred 24 hours a day. The Spring of 2015 saw the female osprey return on the 19th March. It was unusual for the female to arrive before her mate but reports of bad weather slowing down migration from the south allayed any immediate fears with regards to the whereabouts of the male 11(98). The female spent her initial days in and around the nest chasing invading crows, catching fish and scanning the horizon for the return of her long term mate. As the weeks wore on the Glaslyn community reluctantly accepted that their beloved Super Osprey 11(98), who had done so much for his species siring 26 fledging chicks, wasn’t going to return. Over the following weeks the female had an eventful time seeking out a new mate for herself. She initially received attention from CU2, affectionately known as Jimmy who arrived on April 15th and Blue 80, a returning Glaslyn chick from 2012 who arrived on April 16th. Both these birds gave the Glaslyn community hope at a time when they were still reluctantly accepting that 11(98) was not going to return. They also stirred up a social media storm of interest in the Glaslyn Ospreys with people repeatedly comparing events in the valley to those of a television soap opera. Blue 80 was the only one of these two birds seen mating with the female when, on 20th April, a first egg was laid. However, at this time Blue 80 was no longer frequenting the nest site and appeared to have been displaced by CU2. Mating was noted between CU2 and the Glaslyn female on 23rd April but at this point he too appeared to have gone missing. To add to the drama a 3rd unringed male arrived at the nest site on 30th April. At this point 3 eggs had been laid but it was thought that these eggs were infertile and unviable as there had been no consistent male to provide fish for the female and there didn’t appear to have been a sufficient interval between mating and laying. A further 2 non viable eggs were laid in the following week but the good news was that the newly arrived handsome male appeared to be bonding well with the Glaslyn female. Unfortunately on 12th May the announcement came that CU2 had been found dead near Pentrefoelas, some 25 miles to the north east of Glaslyn. He had just caught a fish and was taking it to a perch to feed when he touched an electricity transformer and was tragically electrocuted. The area where he was found was ideal osprey territory and there is little doubt he was prospecting for potential nest sites and partners. Alas, fate dealt CU2 a cruel hand and it was not to be. Finally, on 18th May in the early hours of the morning came the news that everyone was hoping for, the female had laid her 6th egg. Both male and female took turns in incubating the egg and, to all intents and purposes, it appeared that this egg was viable and that the Glaslyn Valley Ospreys had rewritten the osprey rule book. 5 days later on 23rd May, against all the odds, a 7th egg was laid. 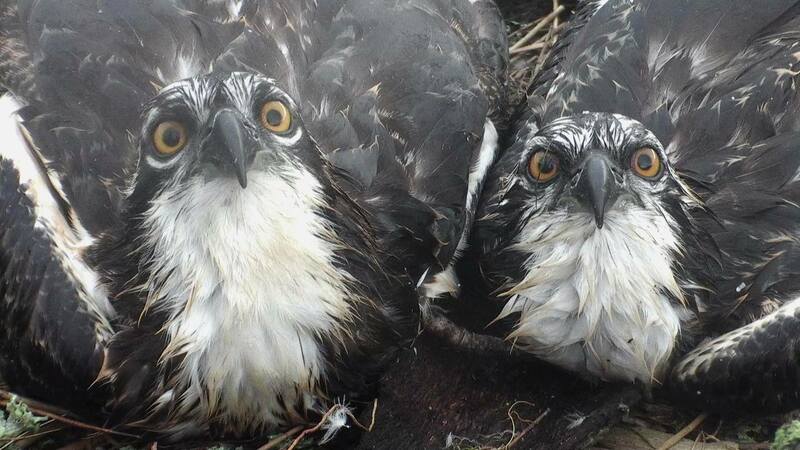 Later, that month, on 30th May the decision was made to give the Glaslyn Ospreys names. The subject of naming ospreys has always been a controversial one. Some people are all for it as, they say, it helps them relate to the birds and avoids confusion. Others are completely opposed to the practice and the perceived humanisation of wild birds of prey. Naming certainly provides clarity when talking about past years in the valley and other male ospreys. When 11(98) was the Glaslyn male, matters were made easier by the fact that he had a ring number to identify him in social media posts and blogs. Followers had also taken to calling the Glaslyn female “Mrs G” so it was decided to adopt this as an official name for her. Thus, the new Glaslyn unringed male was given the name “Aran” after one of the local mountains of Eryri. From 23rd May when the 7th egg was laid all seemed to tick along peacefully on the Glaslyn nest with Aran stepping up to his new role admirably. However, on 4th June the status quo was again disrupted when Aran accidentally knocked the 7th egg out of the nest cup. Mrs G surprisingly failed to notice this and the egg went unincubated for approximately 11 hours, much to the horror of the onlooking team and social media followers. 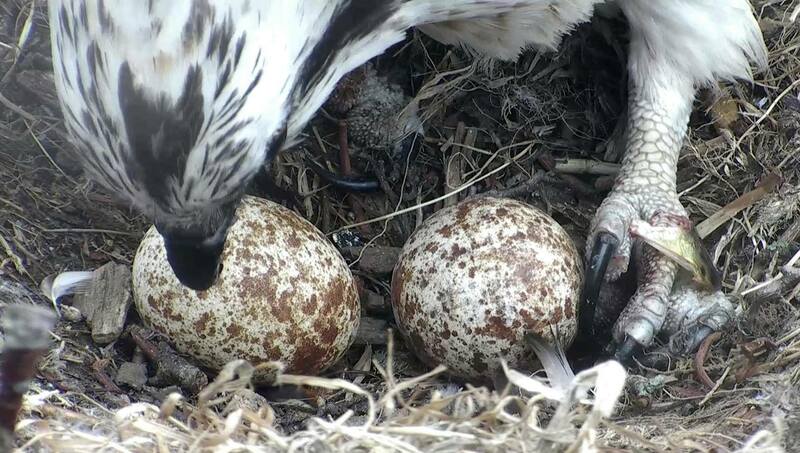 Luckily Aran noticed the displaced egg and moved it carefully back into position. The weather was fortunately warm during these hours of displacement but there were still grave concerns amongst the Glaslyn community that the egg would no longer be viable. On 23rd June a tiny crack appeared in the 6th egg and visitors to the viewing centre watched in awe and relief as the tiny chick hatched. There wasn’t a dry eye in the house as we watched Mrs G feeding her chick with tiny pieces of fish before it had even fully emerged from its shell. Three days later came the greatest miracle of the Glaslyn season when the 7th, partially unincubated chick hatched. The 2015 miracle osprey chicks were ringed on the 1st August. The eldest chick Blue 4R was found to be female weighing 1650g with a wing length of 320 mm and the youngest chick W0 a male weighing 1320g and with a wing length of 296mm. At the time of writing this report all is well on the Glaslyn nest. We are now into the 2nd week of September, the chicks are fully grown and healthy. Mrs G and Aran have bonded beautifully and fulfilled their role admirably. The chicks fledged with ease in the middle of August and will shortly be commencing their journey south. 2015 has been an eventful and, at times stressful year in the Glaslyn community but its story will undoubtedly be retold for many years to come. We will miss our little miracle chicks and wish them a safe journey. We also look forward to the safe return of Mrs G and Aran next Spring and, of course, to the continuation of the Glaslyn dynasty.